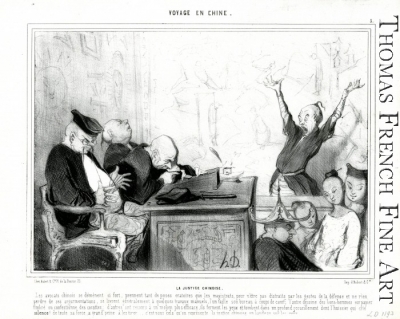 Title: La Justice Chinoise from "Voyage en Chine"
Dimensions: 10 x 13 1/8"; Mat: 16 x 20"
The series "Voyage en Chine" was published in 32 images in "Le Charivari" from December 1843 through June 1845. This is the fifth plate in the series. Deluxe impression without text verso.